Open temples allow clip on cord option. Unique slim temple design with co-injection temple tips. 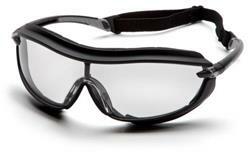 Sports-look safety spectacle with superior eye protection. Includes soft foam padding and an elastic strap.